In my last post I promised to show you how I made the different elements of my dining room roombox. One week later than promised (I blame the nice spring weather we've been having), but here is the first episode: the making of the fireplace mantel. Let me start with a reminder of what the room box looked like 'naked'. In the next three posts will show you how I've made the fireplace, the mirror and the alcove cupboard. 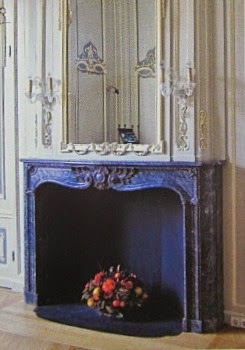 I used this photo of an 18th century Louis XVI fireplace from a house in The Hague as my inspiration. I was not trying to make an exact copy, but I did want it to have those 18th century characteristics and a similar 'feel'. Start of the fireplace mantel. After determining the size and sketching the design on paper, I transferred the design onto a piece of wood. 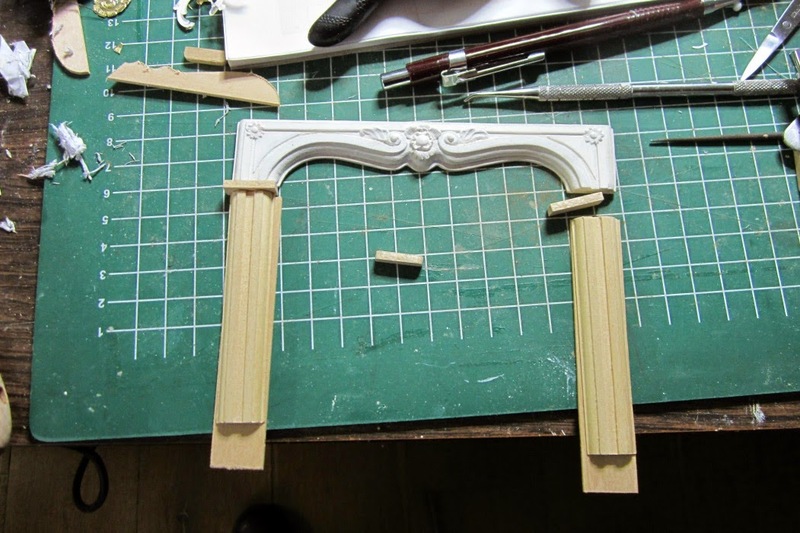 I have cut out the shapes with a saw and then used a router to create the curved and raised moulding. Shaping of the detail in progress. 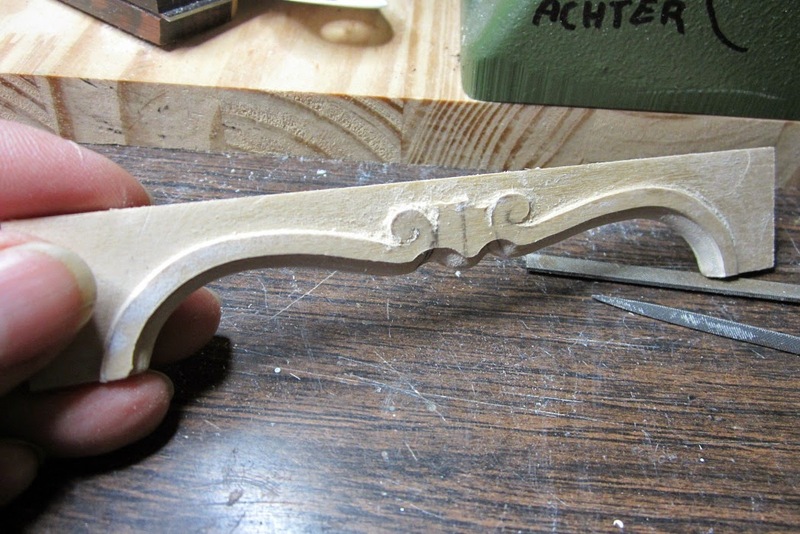 I used Milliput to add the 'carved' detail to the mantel header. Milliput can be shaped like clay for a while before it gets hard. When it has cured you can cut it, drill it and file it like wood. I use many different tools to create the end result: dental tools, cutters, a surgical knife, files etc. The mantel legs are fluted and rounded using the router. The legs consist of several elements to match the lines and shapes of the mantel header. I could have routed both header and legs as one piece and then cut it, but that would have made it difficult to handle while routing. The assembled fireplace mantel. On the bottom of the mantel legs I added plinths with the same shape as the mantel legs, just a little bit bigger. 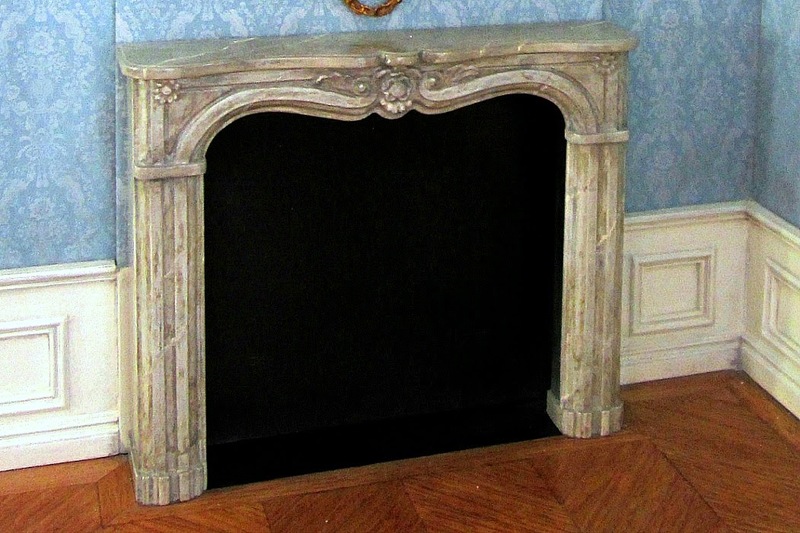 The mantel shelf (foto below) echoes the shape of the header. It took me a fair amount of time to get the right shape on the shelf without it looking clumsy and out of proportion. It was interesting to me how a job like this, which seems simple and straightforward, can be much more difficult than it appears. For the marbling I used acrylic paint which I applied in layers using a cotton rag. Layer after layer after layer of colour, until I was happy with the colour and the effect. In between the layers and washes of paint I used clear varnish and then polished with very fine steel wool to get a shine. I applied the veining with a fine brush, a stick and pencil. After a final varnish I applied a coat of thin wax to give it that lovely shine which marble has. Next time: the making of…the mirror. Wow! What an inspiration you are! So talented! I love your work! Thank you Josefin, that's very sweet of you to say. Thank you for showing us how you made your fireplace, I am impressed :-) It turned out lovely and yes things are often more complicated than what we thought it was going to be. You're welcome Elga :-) Well with the design of the shelf I had a few measurements I had to take into account and somehow I couldn't get the proportions of the curves right. I made several attempts, then decided to go for a straight one, wash't happy with that one either then did another few and finally got it right. Yes, more complicated than I would have thought! Haha, no I don't think I could carve that kind of detail in wood, although I've never tried. It would take much longer though and I did not have a lot of time for this project. Milliput is a great modelers material. Highly recommended. If I would have found one that looked right for what I needed, I probably would have bought it! I'm not fussy that way ;-) Thank you Pepper! Un trabajo muy meticuloso y perfecto, me ha encantado su explicación y el resultado de su trabajo. Thanks for sharing! What a wonderful fireplace!! You made me curious. Beautiful beautiful work! The roombox is lovely but the fireplace is a true work of art. Thanks for showing us your steps. 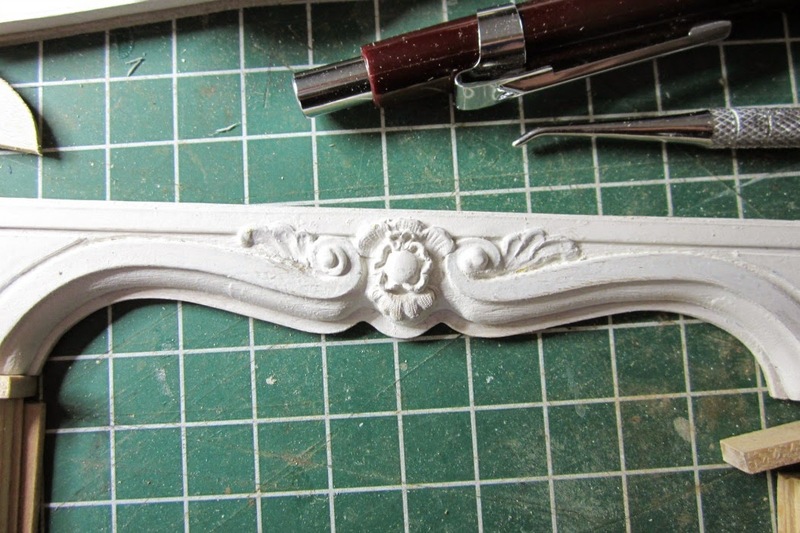 I want to try making mini moulding from air dry clays but too scared to! Yours is perfect. elle est superbe et en plus je découvre ce que c'est que le milliput ! Merci Catherine. Oui, le Milliput est un matériau très utile pour la modélisation. Wow!!!!!! How clever are you??? It is certainly a BEAUTIFUL room! Gracias Isabel! Con la pintura, I días muy ocupados hasta que esté satisfecho. What a gorgeous fireplace. I love how you sculpted the milliput for the center design. Beautiful work! I would so love to know what you do about wood working. I ordered some milliput though I have some epoxy sculpt. I also noticed there are colors. I need to repair some flower pot that broke over the winter. It was great to find it in terracotta color. Catherine, I think with your metalworking skills you'll pick up any woodworking skill with ease. It's just a matter of getting the right tools and maybe someone to explain a few things and you're off. Promise! Yes this milliput is cool stuff. I did a bit of research on the milliput before I started working with it and it has some interesting properties. You can even use it under water! Josje! 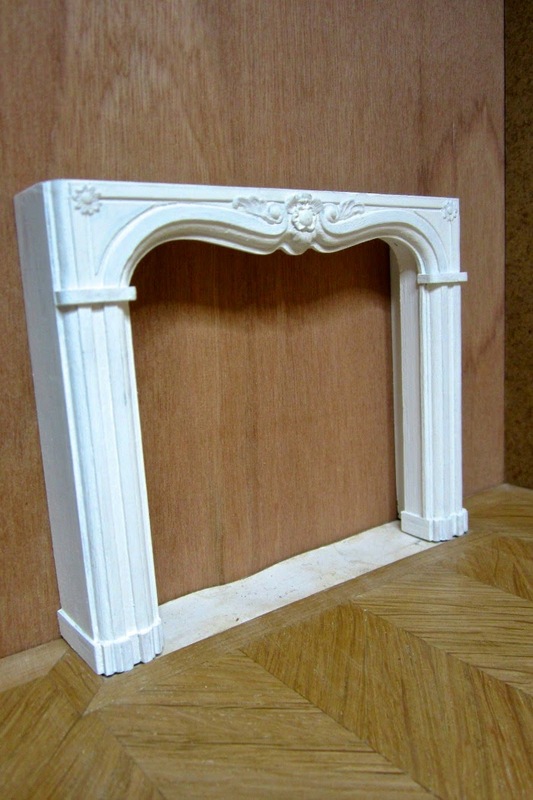 Thank You so much for detailing the process to create this fireplace mantel! It has answered a number of "how do you do it questions" for me as a new miniaturist. You've created a beautiful piece, and I am so impressed by the realism of the shine... it really does look like marble. You're welcome Doug! I'm glad you find it helpful. I must say I always enjoy looking at the way other people make things. Even though I don't use a lot of what I see, it helps me to understand and think of ways I can make something myself. Je openhaard ziet er prachtig uit, Josje en het marmeren is ook erg goed gelukt. Kortom, je hebt een prachtstuk gemaakt voor deze roombox! Bedankt voor het delen van hoe je dit werk gedaan hebt. Ik heb echter nog nooit van milliput gehoord, het lijkt me erg handig spul. Is dit toevallig ook in Nederland verkrijgbaar? When I look at your room I don't know what to look at first! My eyes were on the door then came the fireplace. So beautiful! There is a real Grandeur to your rooms Josje, and a complexity underpinning their simplicity! 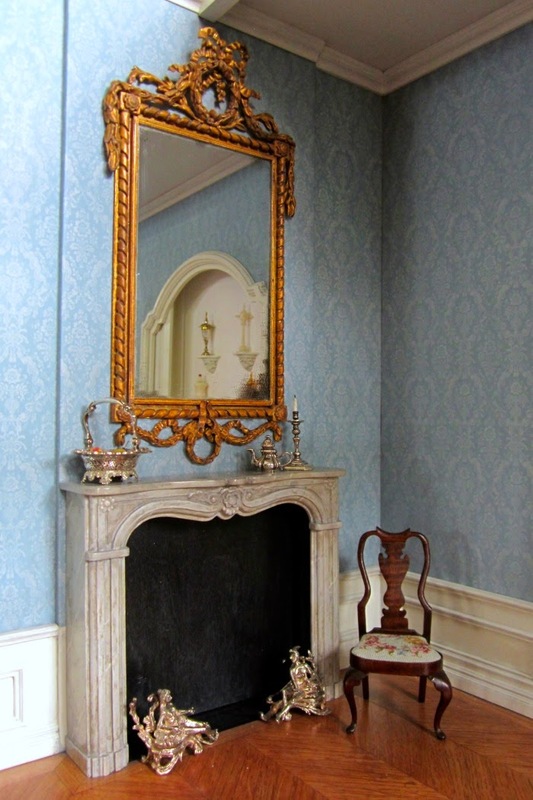 You have made everything about this Fab Fireplace, look Just Right! The fireplace, the cupboard, and the window are all in harmony with each other. Thank you for letting us see how you made this little gem of a surround! ;WOW ! Thank you for your kind words Elizabeth! Working with the router makes sense but I still can't figure out how to make those nice smouth curves with the router. And I really like your marble painting, great colors and the details with the use of milliput! Sounds like a good idea! Will you be at the Geoff Wonnacot workshop next month? Yes I will, the weekend one. You too then? Gezellig! Oh yes, a LOT of work. Yes me too the weekend one! Zeker gezellig! Merci Josje pour vos explications de votre méthode et matériaux utilisées. Jamais je n'aurais pensé à faire des sculptures moi même mais maintenant je vais oser essayer. Thank you Jean-Claude! I'm glad you will try it yourself now. I think with the explanation of the mirror next time you will find it even easier to start doing this yourself. Have fun! How beautiful work!! I love the Louis seize Style! My friend Fatima will be in Amsterdam very soon. I was wondering if there is a Miniature store in Amsterdam that yoou would recommend. Hi Janine, I was just thinking that if the woodworking part of it is too difficult, I'm sure different types of card or mount board could be used instead. 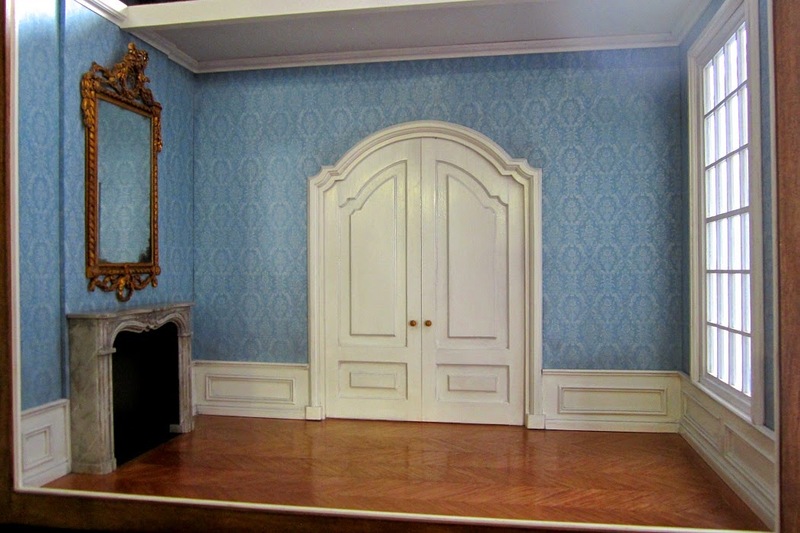 If your friend is a miniaturist she must of course visit the dolls houses in the Rijksmuseum! I hope she'll enjoy her visit here. Thank you Josje, I will let her know. Fatima did write and said she was disappointed not to see more artisan work in the store she went to in Paris. Talented in so many ways and that's the result : A beautiful looking fireplace .It was very interesting to see your step by steps, even though it is not possible for me to make something like this. Your room-box is amazing to look at. I love how you made your fireplace. Thank you for showing the different stages of the build. I have to develop my skills a lot more before I could even think about making a fireplace as beautiful as yours. You're welcome Jayne. I think that just watching or seeing other techniques or how other people make things will help in developing your skills. And maybe one day you will use some of it on your own project, or you may do it totally differently. Above all: have fun! What an elegant room! I love the wall colour and the fireplace is perfect, it's great to see how you made it too, the details are perfect! Thank you Andy! Good to hear from you again. The wallpaper is from Susan Bembridge, but I put a wash of blue paint over it. You have done a fantastic job capturing the 18th century characteristics. I have often considered starting a doll house for my granddaughters. I am personally captivated by the miniatures that are in the house at the Museum of Science and Industry in Chicago. They have an entire room dedicated to it. Thank you for your kind compliment Carry. Why not start on a doll house? If not for your granddaughters, then for yourself. Do you mean Colleen Moore's Fairy Castle? Unfortunately I have never seen it in real life, but in the photos it looks truly wonderful.